— You brighten my day. — You warm my heart. — I am blessed to have you in my life. — I love your style. — I believe in you. —I love you and I thank you. Well, I can tell you, not with a vacuum, electric skillet or rug shampooer. Those gifts may be needed, however they don't speak to the heart of the recipient. In the language of "women-world," we'd like something personal for this gift giving occasion. And there is nothing like jewelry to make that memory a lasting reality. This Valentine's Day we have many ideas to warm the heart of your someone special. Let us be your "triage" gift giving consultants. We will help you choose a beautiful gift that will be remembered and appreciated as the individual and personal gift that it is. Jewelry doesn't wilt or put on pounds, always fits and makes a memory. And we gift wrap to add that special touch. 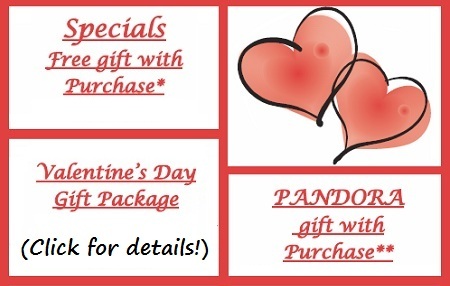 Please check out our wonderful "gift with purchase specials" as well as our Valentine's gift package. And let's not forget the gentlemen! We have a wonderful selection of man's rings in sterling with black onyx and other gems that fit any style. Remember, we are just a phone call away and would be happy to be your "2012 Cupid Consultants!"